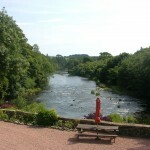 Sea Trout return to the River Annan each year to breed. Whilst Salmon and Sea Trout may be viewed they cannot be fished. Salmon and Sea Trout Fishing can be arranged locally.